A circular chamber made entirely of recycled cardboard with seating for 30 meditators, has turned up at Burning Man this year. The architect is Paul Discoe, designer of Larry Ellison's multimillion-dollar Japanese-style estate in Woodside. SFGate takes a look. Also, (an unrelated project) but check out Uchronia, a wicked timber structure. A Zendo, designed by Paul Discoe and Amy Van Nostrand, Burning Man 2006. Photo by Richard Lang for SFGate. Uchronia, or the "Message from/to the Future" art installation, also commonly known as the "Belgian Waffle. 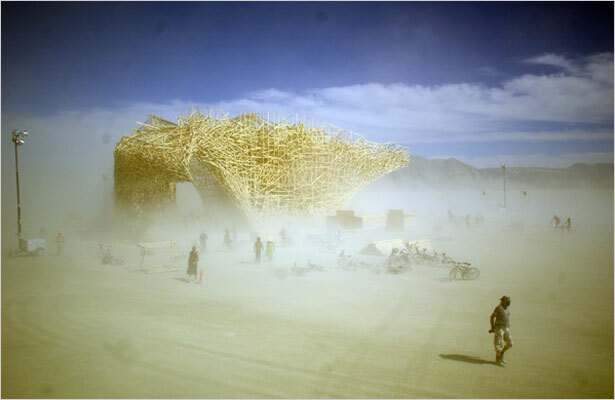 "created by Jan Kriekels and Arne Quinze at Burning Man 2006. Heidi Schumann for The New York Times.